When I first discovered crumb cakes, we were living in Oregon, and there was this little cafe in Lake Oswego, that had the most incredible breakfast menu. It was a tiny little place. A cute white cottage, that locals knew to be a sweet slice of heaven. They had crumb cakes, or as they called them, coffee cakes, American scones, which a grew to love, and of course the usual breakfast food. I’m sure those breakfasts were lovely too, but that’s not why everyone was lined up out the door, in the middle of winter, waiting patiently to get a tiny table in this tiny place. The pastries, and the baked sweets were all you could think about the whole drive there. I got quite used to Jon and I going out for breakfast every Sunday morning. When we had Hunter, we wondered if we could actually manage to keep our Sunday date. But she was one of those angel babies. She just smiled and laughed, and hardly ever cried. She was the perfect brunch companion. Once we become a brood of four, things got a little harder to manage, so I started trying to create crumb cakes at home. Coming up with a recipe is harder than it sounds. 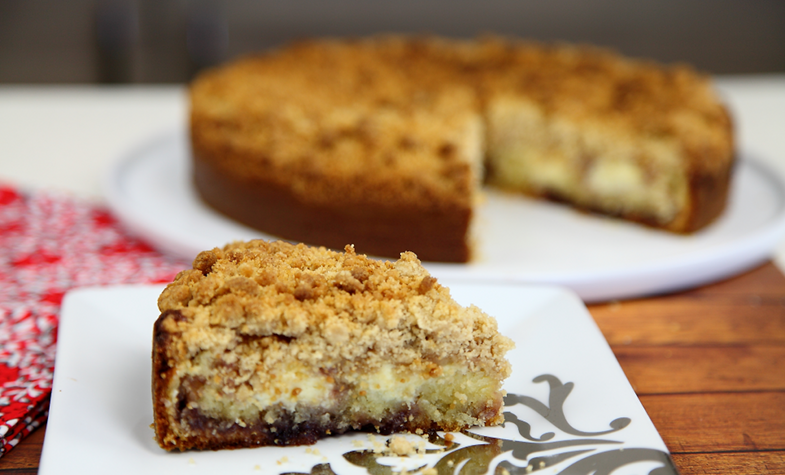 Getting that perfect balance between fluffy sponge, fruit and crumble took quite a while to achieve. Adding the cream cheese, I must admit, while it takes a little longer, costs a little more, and may make this recipe sound quite intense, it makes the whole thing even better than any I’d tried before. And that, dear friends, is the story of how a cake decorator fell in love with baking. Preheat oven to 205°C/ 400°F. Generously spray or butter and flour a 9-inch (22cm) round springform pan. Place all the ingredients in a bowl, and stir/ mash with a fork until combined. Set aside. Place the butter, sugars, cinnamon and salt in a bowl, and use a fork to mix. Stir in the flour, then blend with your fingertips until incorporated. 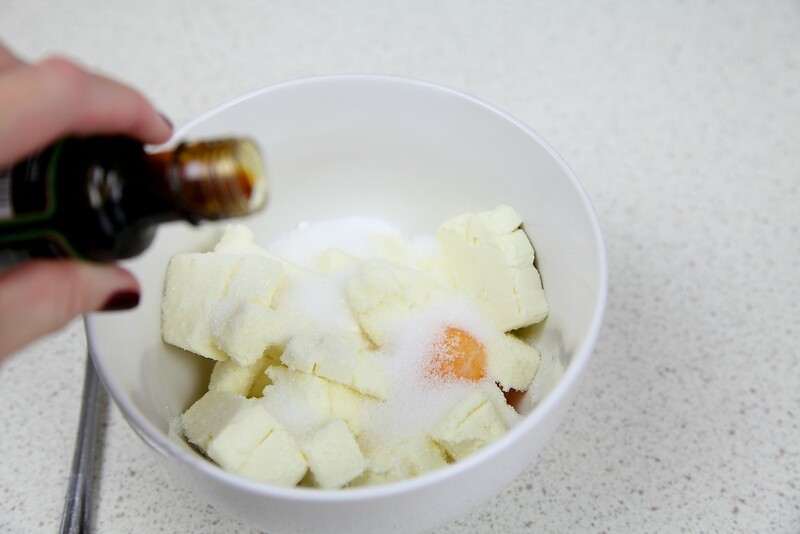 Whisk together butter, milk, and egg in a large bowl. Mix together the flour, baking powder and salt in a bowl. Then whisk in the sugar, flour mixture (mix flour, baking powder and salt) until just combined. Now we are ready to assemble all our layers of this recipe. 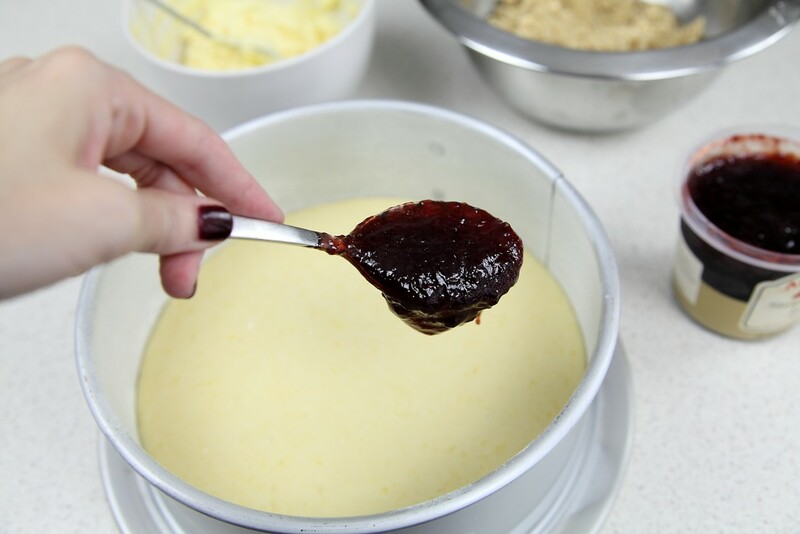 Spread jam all over the surface, and then add chunks of the cream cheese filling. Then swirl batter with a fork to spread everything out. Try not to over-mix. 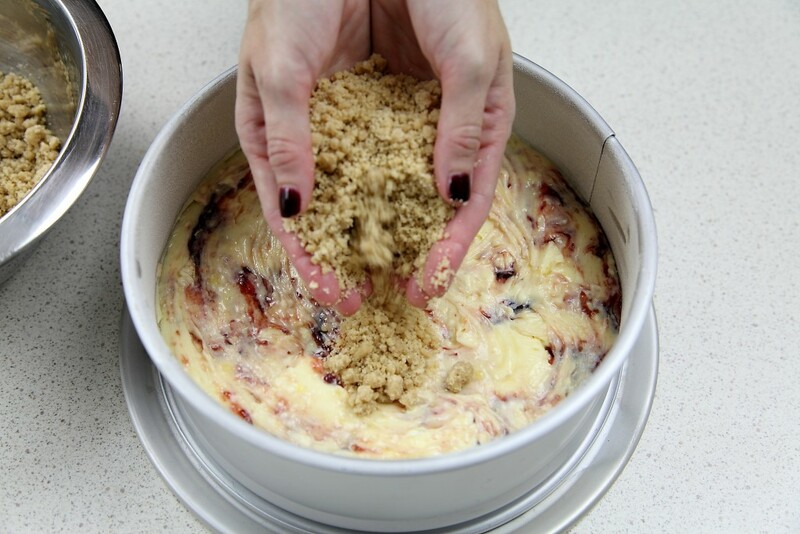 Lastly, sprinkle crumbs over the cake. Bake cake until a wooden pick inserted in center comes out clean and sides begin to pull away from pan, about 25 minutes. Cool in pan on a rack 10 minutes. Enjoy this amazing, warm cake for dessert with ice-cream, or on it's own for afternoon tea. It lasts in an air-tight container for 5 days. This cake looks so good! Have you ever made it with fresh strawberries? Im considering how to incorporate them–either a rough puree lightly sweetened or just chopped and swirled in. I guess that would depend on their sweetness. Any advice? I have, but they didn’t give the moisture, and texture of the jam, chopped up. I would puree at the least, maybe add some sugar. Hi.. can i use homemade crem cheese since ready made stuff is not available where i stay? and also i dont have the strawberry jam.. can i use regular mixed fruit jam? sure, both those changes work.